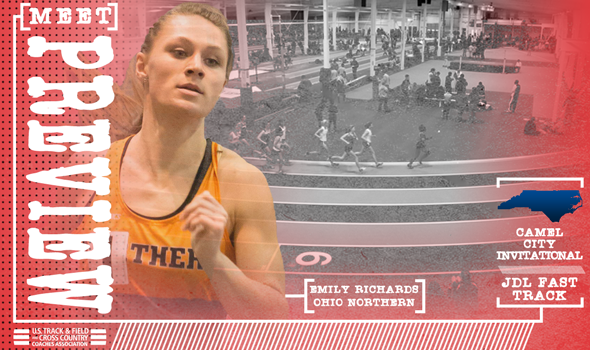 For the first time in her career, Emily Richards didn’t fly under the radar last summer. That’s because Richards, then a junior from NCAA Division III Ohio Northern University, was on the big stage under a bright spotlight. Richards proved herself across two cutthroat rounds of the 800 at the USATF Outdoor Championships and punched her ticket to the final. If Richards could beat five of the other women in the race – Ajee’ Wilson, Charlene Lipsey, Brenda Martinez, eventual 2017 The Bowerman winner Raevyn Rogers, Chrisuna Williams, Samantha Watson and 2015 The Bowerman winner Laura Roesler – she’d represent Team USA in London. A trip to England wasn’t in the cards for Richards, however, as she finished eighth in the final with a time of 2:01.74, her fastest of the meet. She found herself boxed in early and was too far out of position when the leaders started to kick. Richards’ performance in Sacramento, California capped a stellar outdoor season that saw a remarkable progression. The native of Delaware, Ohio won two NCAA individual titles in May, qualified for the USATF Outdoor Championships with a stellar 2:00.62 PR at the Music City Distance Carnival and then opened a lot of eyes in the Golden State. Since then, Richards showed her range during the cross country season with a ninth-place finish at NCAAs and recorded the second fastest time in NCAA DIII history over 3000 meters indoors (9:23.61) back in December. Now, after a short break, Richards returns to the track for her first competitive 800 of the season this weekend at the Camel City Elite in Winston-Salem, North Carolina. She’ll line up alongside four women from the NCAA DI ranks and four professionals, one of which is 2017 NCAA DI outdoor runner-up Hanna Green. Richards could very well take a Polar Bear-sized swing at the collegiate indoor record book. A time of 2:01.84 would put her in the all-time top-10, 2:01.64 in the top-5 and anything faster than 2:00.69 gives her the No. 1 spot over Jazmine Fray. Be on the lookout for a number of other collegians competing on the JDL Fast Track, including Matt Molinaro (Richards’ teammate at ONU), just about the entire Virginia Tech distance medley relay team in the mile (Vincent Ciattei, Neil Gourley and Patrick Joseph) and 10 NCAA All-Americans from the 2017 cross country season split between two elite heats of the 3000 (Amon Kemboi and Lawrence Kipkoech of Campbell, Azaria Kirwa of Liberty, Adam Craig and Jonathan Dahlke of Mount Olive, Kigen Chemadi and Jacob Choge of Middle Tennesee State in the men’s race; Caroline Sang of Charlotte, Leah Hanle of Mount Olive and Elly Hennes of NC State in the women’s race).